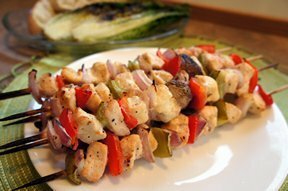 A delicious grilled chicken kabob that is perfect for the summer grilling season. These skewers are worth the work of making each one. Have the kids create their own masterpiece to lighten the load. The vegetables add great flavor to the meat and you get your vegetables and protein together on one stick. See step-by-step instructions on grilling summer and winter squash using skewers. Here you will find useful tips on grilling fruits and vegetables, along with suggested grilling times for both.